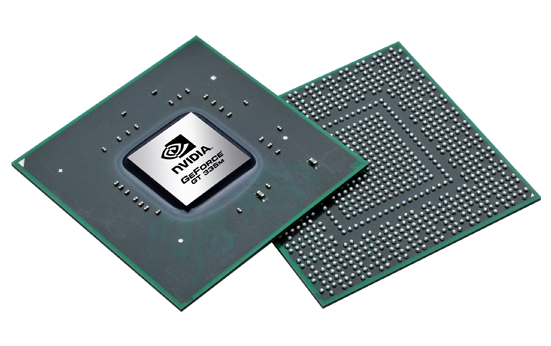 The Nvidia GeForce GT 335M (sometimes also called GeForce G335M) is a laptop graphics card for middle class gaming notebooks. It is based on the GT215 core (as the GTS 350M for example) but features only 72 shader cores and 24 Texture Mapping Units. Therefore, the GT 335M offers significantly more shaders than the GT 330M, but due to the low clock speed, the performance is not that much better. Compared to the GTS models, the GT 335M does not support GDDR5. The 3D performance of the GT335M is on a level with the Mobility Radeon HD 5650 in the middle class. Therefore, the GPU is fast enough for all games in 2010. Demanding games like Metro 2033, Battlefield BC2 or Crysis run only in low-medium details fluently. Less demanding games like Call of Duty MW2 or Sims 3 can be played in high detail settings (see Benchmarks below). As the other GeForce 300M cards, the GT335M offers Purevideo HD (VP4) to accelerate the decoding of HD videos. This means that the GPU offers the complete decoding of MPEG-1, MPEG-2, MPEG-4 ASP, VC-1/WMV9 and H.264 videos. Furthermore, CUDA, OpenCL, and DirectX Compute allow the usage of the cores for general computing (e.g., encoding of videos).